A simplified explanation of the work that I am doing now is that it is a visual recording of all the places I have been in the last few years. France, England, Ireland, the California coast line, Hawaii, and of course, my home. The more complex explanation of this body of work is that it is a recording of how I made that journey. It is the journey of my heart. The things that speak to me and make even the difficult parts of life, palatable. I have found that everywhere, others share my love of simplicity. I want to paint the adventure of an everyday story. The story that is written when we love our families and friends. When we build our homes. When we enjoy our work, and when we put our faith in Love. We live in an imperfect world. We are imperfect beings. But, we have the ability to focus on what is lovely. My desire is that the message in the art is subtle enough to allow each individual to find what they need in the painting – to make room for their story as well. It’s so amazing to see how God uses our gifts moving through other’s lives, weaving a tapestry of hope through their stories. This is the journey that I am on. This is a glimpse of my Story. 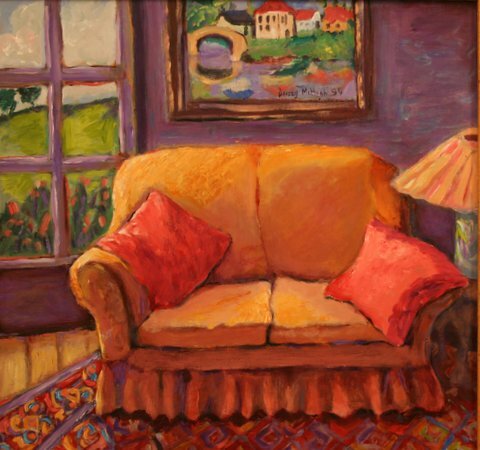 Dorsey McHugh’s bright and reassuring paintings feel like coming home, but the beginning of her life as a painter grew out of a time of loss. 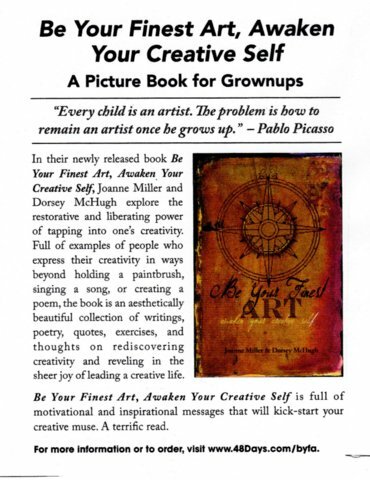 Dorsey had just begun taking art lessons when her father, a friend and confidante as well as a parent, passed away. She was 40 and it was a turning point in her life. Her art is an expression of faith that there is always light even in the darkest of situations. As Dorsey continued to explore painting, she created her own technique. She says, “Pure bright colors can be vibrant and dramatic. They may be beautiful to look at, but tiring to the eye. Complementary colors are restful to the eye. They are easy to live with. Nature mixes complementary colors. 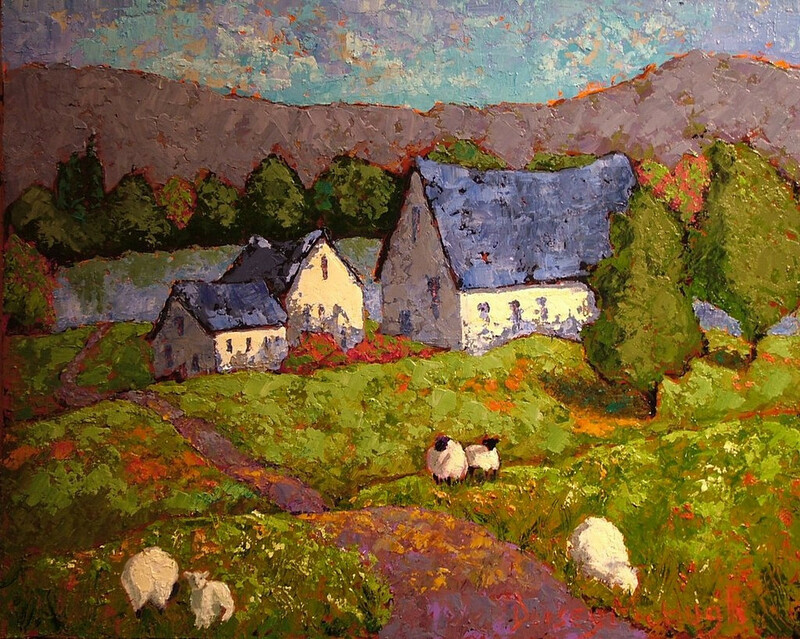 For instance, if you look closely, green grass has a lot of red in it.” Dorsey mixes her own colors, adapting her palette to a technique she created intuitively. What will eventually be a blue sky might start out as bright orange. As she layers different shades of paint with her palette knife, her trademark warmth comes out, and the painting is brilliant without being overpowering. Dorsey’s longings for a harmonious world in which nature and mankind are in gentle balance are reflected in her acrylics with colors of joyous yellows, blues, reds and greens. Dorsey’s homes and villages seem to grow in a compliance with nature. She gives us a refuge of peace, calm and the love between man and nature for which so many long. Even the titles carry inspiration: “Reason to Smile,” “Refuge Found,” “Freedom from Fear” and “Hope.” She combines words, titles, color and light in a whimsical combination of reality and imagination. Through line and color, Dorsey inspires others to remember that there is light even in the darkest times. A native of the Black Hills of South Dakota, Dorsey McHugh currently resides in Nashville. Her work can be seen in galleries in Hawaii, Washington D.C., Nashville, southern California, Chicago, Park City, and Carmel. Bibliography (*Reviews) “Art in the City”, her Magazine, November 2011. “Women’s Work”, Nashville Arts Magazine, February 2011. 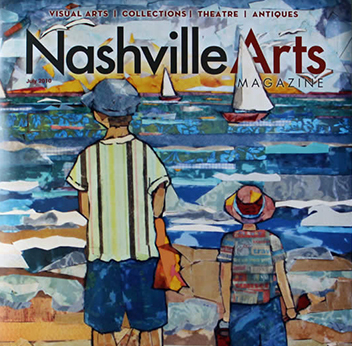 Nashville Arts Magazine, cover art, July 2010. “Welcome Inn”, Phil Keaggy Music, CD cover art, Winter 2009. Courage Cards, seasonal card collection, selected art, Winter 2009. Worship Today, monthly music publication, cover art, 2008. “The Color of Love”, Nashville Arts Magazine, cover and feature article, June/July 2007. ”Harsh Winter”, nationally televised special, Feed the Children, February 2006. ”Auld Alliance Gallery showcases artists of the Southeast”, Green Hills News, March 31, 2005. Bill and Wendy Hornbuckle, President & CMO – MGM Hotel, Las Vegas, NV. Dan and Sarah Lemaitre, President & CEO – White Pine Medical, Park City, UT. Ivan Seidenberg, CEO, Verizon Communications, Chandler, Arizona. Kevin Shaha, President, Racor, Inc. Sandpoint, Idaho. Hillwood Country Club, Nashville, Tennessee. Victor Ivashin, HyperBaric Systems, Santa Rosa, California. Education Juanita Greene Parks, Nashville,Tennessee, 1985. JGP Artists Group, Nashville, Tennessee, 1985-1988. 2004 – Foxhall Gallery, Washington, D.C.
2003 – Lyons View Gallery, Knoxville, Tennessee. 2002-05- Anne Irwin Fine Art, Atlanta, Georgia. 2011 – WOMEN’S WORK, Bennett Gallery, Nashville, Tennessee. 2007-10 – ART OF WEBBFEST, Knoxville, Tennessee. Sponsored by Webb School. Invitational. Featured Artist 2008. 2007-10 – GILDA’S CLUB ART AUCTION, Nashville, Tennessee. Sponsored by Gilda’s Club. Invitational. BRENTWOOD ACADEMY FINE ART SHOW, Nashville, Tennessee. Sponsored by Brentwood Academy. Invitational. 2003-09 – SMALL WORKS SHOW/GROUP EXHIBITIONS, Foxhall Gallery, Washington, D.C.
2002-10 – HARDING ART SHOW, Nashville, Tennessee. Sponsored by Harding Academy. Invitational. Featured Artist 2003. 2005-06 – SMALL WORKS SHOWS/GROUP EXHIBITIONS, Anne Irwin Fine Art, Atlanta, Georgia. 2004-08 – ART AUCTION. Montgomery Museum of Fine Arts, Montgomery, Alabama. Curated by Margaret Lynne Ausfeld. Invitational. 2001-08 – GALA, Huntsville Museum of Art, Huntsville, Alabama. Curated by Peter Baldaia. Invitational.